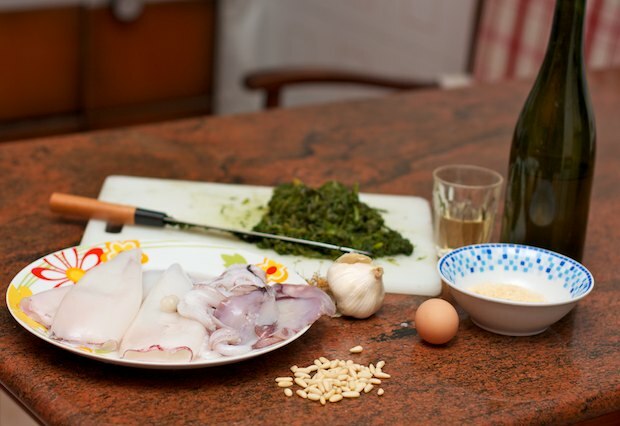 I have a typical recipe of the cuisine from Veneto and Friuli regions in Italy for “Calamari in Umido”. Since I am not fond this preparation, I thought of a way to make the dish lighter. The recipe that I propose combines spinach with a few pine nuts. 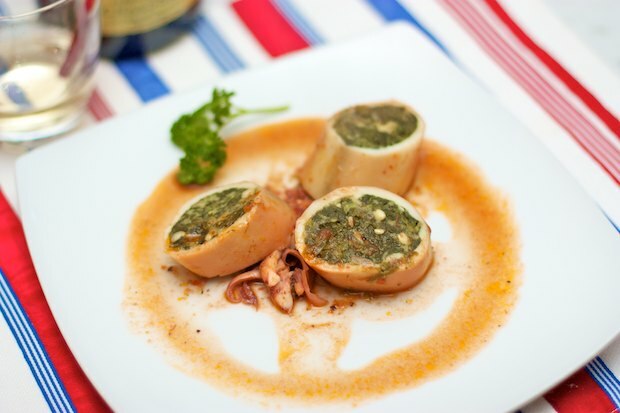 Overall, the dish is easy to digest and not very caloric. 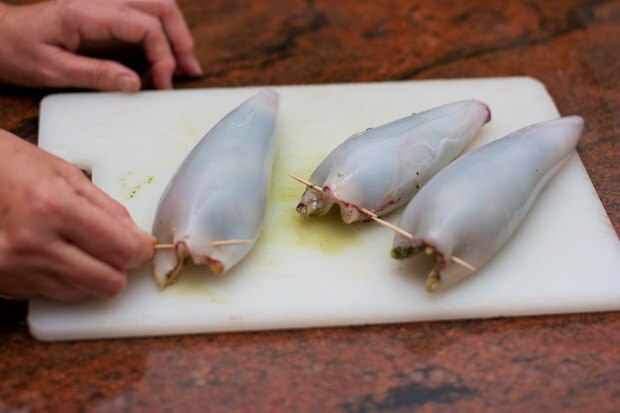 I recommend that you cook it in the morning or the night before you eat it because the squid are easier to cut when they are cool. Thaw the spinach according to the instructions on the bag. Squeeze it out well and place in a bowl. Add the pine nuts, breadcrumbs, egg, salt and pepper. 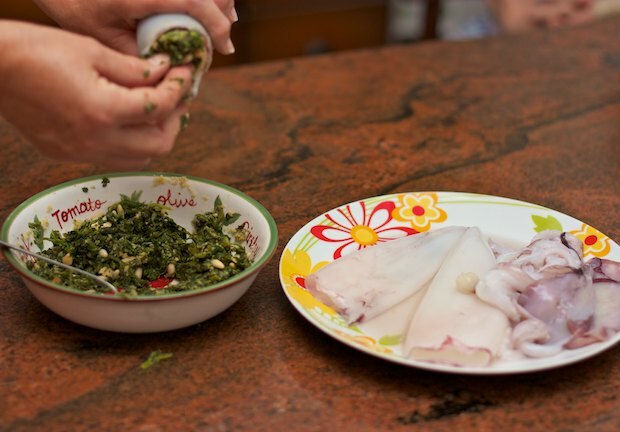 Dry the calamari well and using a small spoon, stuff them with the spinach mixture. Keep the tentacles aside. Close the opening with a toothpick. Add some olive oil pot, along with the garlic and tomato sauce. Turn on the burner and after a few minutes, add the squid with tentacles. Boil 5 minutes, then pour in the wine and let it evaporate. Cover the pot and cook for another 35 minutes on medium heat, stirring twice. After this time, allow it to cool. When they are cool, cut into small pieces then add them back into the pot along with the tentacles. Reheat just before serving, without letting them boil. 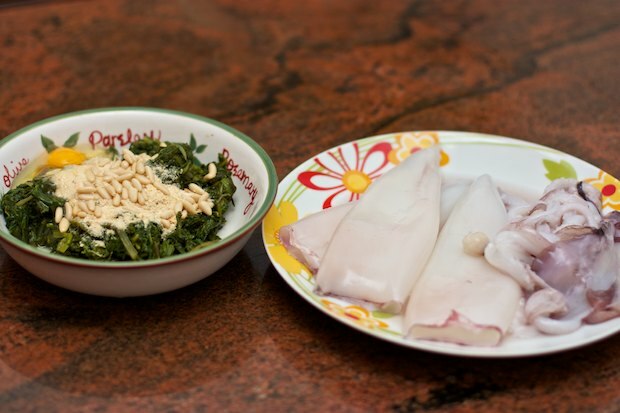 Place a portion of the tentacles on each plate and radial slices of squid. Top each portion with a little sauce. Posted in Fish, Recipes. RSS 2.0 feed.